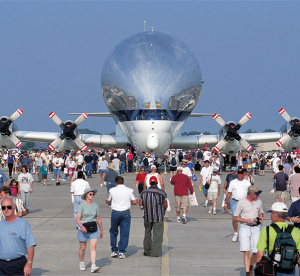 NASA’s Super Guppy cargo aircraft pulls in the crowds at a previous EAA AirVenture in Wisconsin. When Wittman Regional Airport in Oshkosh, Wisc., becomes the busiest airport in the world for the Experimental Aircraft Association’s AirVenture fly-in, July 25-31, 2016, NASA will be there to show thousands of attendees how NASA innovation drives our journey to reach new heights, reveal the unknown and benefit all humanity, with a special focus on NASA’s contributions to aviation. The new NASA Pavilion, located in the EAA Aviation Gateway Park, will house exhibits about NASA’s work to transform aviation, including the New Aviation Horizons initiative to build and fly a series of X-planes over the next 10 years. Air Show visitors can also check out exhibits about electric propulsion, quiet supersonic flight, air traffic management for drones, and models of important aircraft from NASA’s predecessor – the National Advisory Council for Aeronautics, or NACA – through designs for aircraft in the 2030s and beyond. Hands-on demonstrations of aerodynamics for different wing shapes will be provided with the use of an innovative water table. 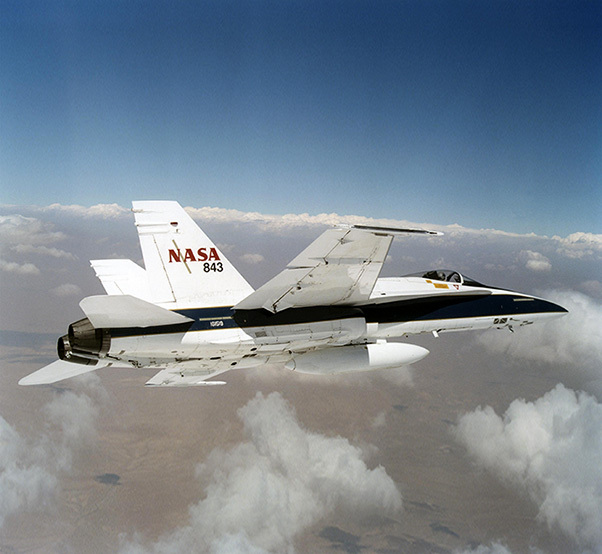 Take a look back at the many exciting contributions to aviation and space made by NASA’s Glenn Research Center in Cleveland, which is celebrating its 75th anniversary this year. NASA Glenn exhibits will focus on their research and development of technology to advance aviation, enable exploration of the universe, and improve life on Earth. 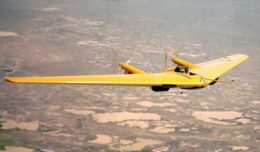 Exhibits from NASA’s Langley Research Center in Hampton, Va. will focus on autonomous vehicles, electric aircraft and hypersonic flight. An F/A-18 mission support aircraft out of NASA’s Armstrong Flight Research Center will fly in to EAA AirVenture on Friday, July 29, 2016. Other exhibits in the Pavilion will highlight NASA’s work on the journey to Mars, International Space Station, solar system exploration, Earth research expeditions, and space technology. Visitors will be able to touch a piece of the moon – a rock collected during the Apollo 17 mission (available July 25-28) – and see space suits made for astronaut Shannon Lucid and for Apollo 8 lunar module pilot Bill Anders. Also on hand will be the chair used by space shuttle commanders to suit up before launch. Next door to the NASA Pavilion in Aviation Gateway Park is the Innovation Center, which will showcase NASA partner exhibits for the Space Launch System and the Orion crew exploration vehicle. NASA will be well represented on the flight line too. 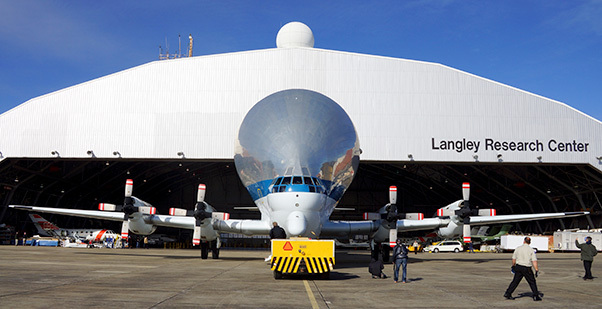 NASA’s unusually shaped Super Guppy cargo plane based at NASA’s Johnson Space Center, which has been used to ferry huge space and aviation components, is expected to be available for viewing July 25-26. On July 29, one of NASA’s F/A-18 research aircraft from NASA’s Armstrong Flight Research Center is scheduled to jet into Oshkosh for the weekend. Both aircraft will be located at the Boeing Centennial Plaza. 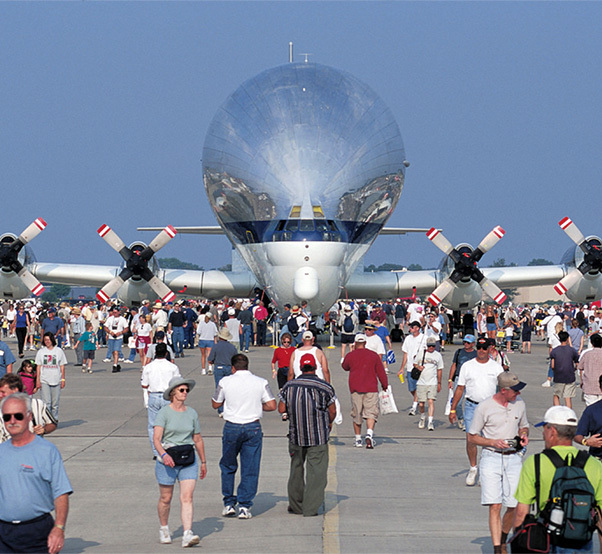 The Super Guppy, designated 377SG-201, has a cargo compartment that is 25 feet tall, 25 feet wide and 111 feet long. Its unique hinged nose opens more than 200 degrees, allowing large pieces of cargo to be loaded and unloaded from the front. NASA also will host several presentations throughout the event, including: a look at the experience of flying a NASA research aircraft; a panel to include representatives from NASA’s Ames Research Center, the Federal Aviation Administration, and Google, as well as the EAA president, who will discuss efforts to allow for safe, shared use of the national airspace system by manned and unmanned aircraft; a news conference with Tecnam and NASA researchers about current work to build the X-57 “Maxwell” plane to test electric propulsion; a forum to explore self-flying aircraft and electric motor technology; and talks by NASA astronauts including three-time space shuttle astronaut Janet Kavandi who now serves as the director of NASA Glenn.